Shakespeare & Company doesn’t only do Shakespeare. This season, only three out of nine productions are by the company’s namesake, though several others play with Shakespearean themes, from a contemporary reflection on war to a political farce that resonates cheekily with the Bard’s most problematic comedy. That one is The Taming. Loosely inspired by his misogynistic comedy about that Shrew, it’s the smartest, funniest show I’ve seen in a long time. The premise is deceptively nutty: two political operatives on opposite sides of the Red/Blue divide, trapped in a hotel room with a Miss America contestant. But it’s a sly notion that skewers both ends of the political spectrum while upending both its Shakespearean model and a few of our own smug presumptions. Patricia, a black conservative and powerhouse aide to a philandering Republican senator, is mirrored by Bianca, an angry white woman and left-wing blogger. Patricia lives by the watchword “What would Condoleezza do?” and Bianca lives by her phone, conducting progressive “trusades” in the Twittersphere. Between the two antagonists stands Katherine, a cute-as-pie Miss Georgia and walking blonde joke – except she’s also got a degree in constitutional law, and her ambition is to remake America’s broken politics. Lauren Gunderson’s audacious play mixes slapstick and history – a serious comedy that packages its lessons in the zingers. Nicole Ricciardi’s tight 90-minute production keeps them flying as the setting darts between two hotel rooms, one in today’s Atlantic City, the other in 1787 Philadelphia during the arduous drafting of the U.S. Constitution. The three performers are pitch perfect: Tangela Large as right-wing Patricia (= Petruchio, if you’re tracking the Shakespeare), straining to maintain her professional and personal dignity despite a distasteful boss and missing trousers; Lucy Lavely as lefty Bianca, for whom the internet is a weapon; and most hilariously, Maddie Jo Landers as Katherine, a sequined Georgia peach with a smile that’s dazzlingly insincere and an agenda that’s in dead earnest. Gunderson is an equal-opportunity political and social critic, though her heart clearly beats on the left, and her gift for comedy matches her patriotic passion. I’ve never laughed so hard while thinking so much. 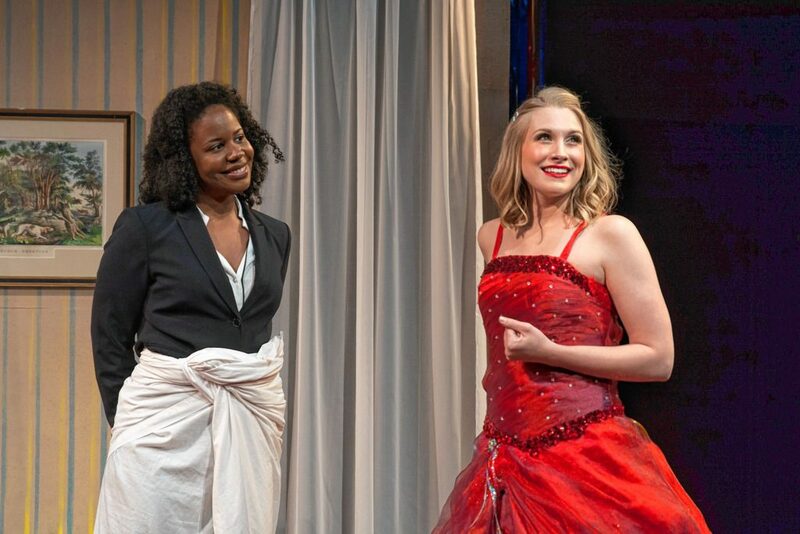 In her opening-night curtain speech, director Tina Packer called The Merchant of Venice “a comedy mixed with a tragedy mixed with a comedy mixed with a tragedy – a muddle, but a creative one.” And it’s true: the play is a romantic comedy that gets its juice from Jew-baiting, with casual racism and sexism and suggestions (made explicit here) of an unrequited homosexual love. Packer, along with set designer Kris Stone, lighting designer Matthew Miller and costumer Tyler Kinney, has created a sparkling Venice at Carnival time, its air alive with a Babel of languages and its streets aswirl with the colorful traffic of a world port, overhung with glass globes enclosing starry universes. “We haven’t held back on the play’s anti-Semitism” or other distasteful elements, Packer said. But she’s overcompensated for them on the comedic side. For example, the three “casket” scenes, in which suitors vie for the hand of the beautiful and wealthy Portia, are reduced to burlesques that diminish the stakes and belittle the play’s central love story. A few intentional anachronisms occasionally appear from nowhere, mostly for laughs, including a cheap but effective Trump gag. Packer has also allowed (or encouraged) her actors to go overboard with shrill histrionics as well as buffoonery. Again and again, things are over-emphasized, over-acted or simply loud. Three of the performers break this mold, creating moments to treasure in an otherwise annoying spectacle. 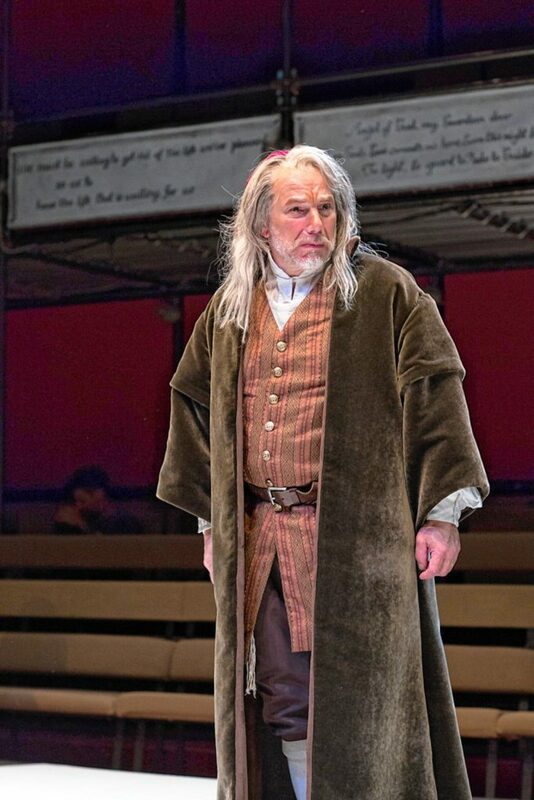 As Shylock, the despised and vengeful Jewish money-lender, Jonathan Epstein carries a piercing world-weariness, a man forcing himself forward through a hostile world till he finally detonates. John Hadden, a company founder back on its stage after a long absence, is painfully affecting as Antonio, the merchant who pawns his body to enrich his friend and (in this version) lover. 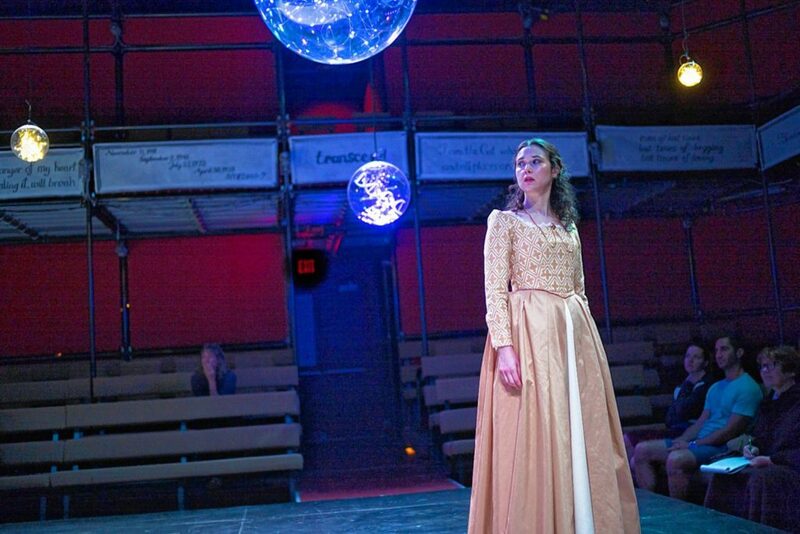 Kate Abbruzzese is Shylock’s daughter Jessica, who runs away with a Christian and her father’s jewels and, in this version, comes to regret it. In one of the show’s subtler touches, we watch doubt, then remorse, steal across her face, making the play’s “happy” ending as fraught and ambiguous as Packer intended. 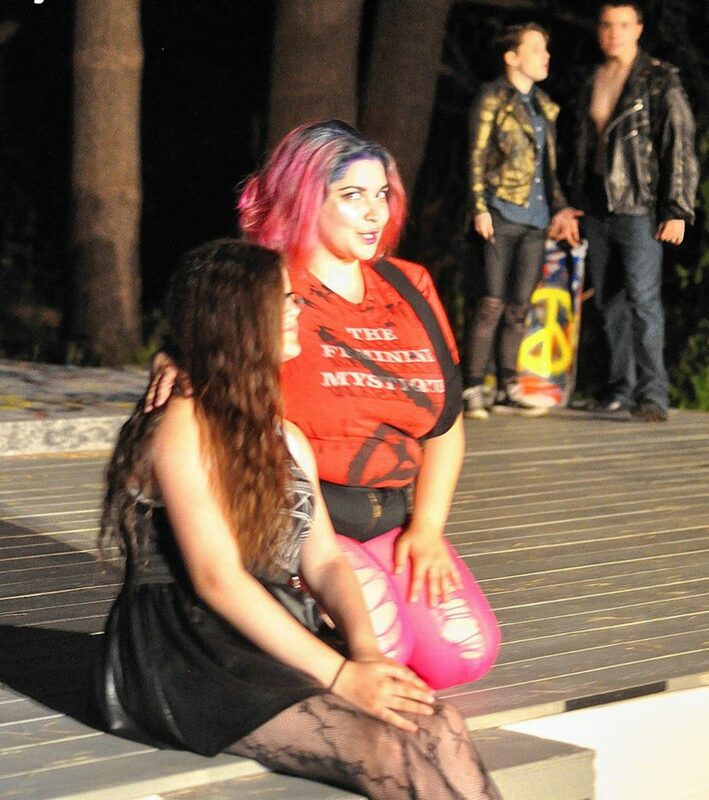 Hampshire Shakespeare Company makes its home on the grounds of the Renaissance Center at UMass, performing on a platform stage that’s framed by a pine grove at the edge of rolling meadows and lit, in the early scenes, by the setting sun. Which would seem to make it the perfect setting for Shakespeare’s most sylvan comedy, A Midsummer Night’s Dream. The trees overarching the stage will do nicely for the next HampShakes show, when Birnam Wood advances on Castle Dunsinane in Macbeth, opening this weekend. Director Martin Hutchinson’s vision seeks out contemporary parallels, exploring “the simplicity and ease of losing yourself to ambition” rather than the usual “stunted masculinity and militarism,” and Beki Rose Berliner’s costumes contrast “colorful, intriguing witches with grim, gray-scale soldiers,” shifting from medieval to modern dress as the blood begins to flow.